Not the best way to start off the Memorial Day Weekend, that's for sure. As most of you know by now, Buster Posey's collision with Scott Cousins Wednesday night resulted in a broken leg and torn ligaments. Far worse? The possibility of pulling the 24-year-old Giants star out for the season. (We hope, pray, collectively vibe this not to be the case.) Above is John Colton's Oliver Stone-like look of Cousins' alleged intentions, showing a clear path to plate but a direct hit aimed at Posey. Pablo Sandoval sent out this message on Thursday morning,"Good morning I feel so bad because we lost buster for rest of the season it's gonna be hard with out him." He backtracked with the following revision, "Talking further within our team, I might have misspoken and hopefully Buster isn't out for the season." Fingers crossed, dear Panda. The Giants point out that Posey has been placed on the disabled list, of course. "Posey placed on DL w/fracture to bone in lower left leg. Fontenot on DL w/groin strain. Ford DL w/ankle sprain," the franchise notes. They don't mention anything about being out for the season. Not yet, anyway. Sally Kuchar, Curbed editor and diehard Giants fan, who was at last night's game, explained to SFist what she witnessed from the bleachers. Couldn't really see much because we were sitting in the bleachers. Watched the reply later at home. 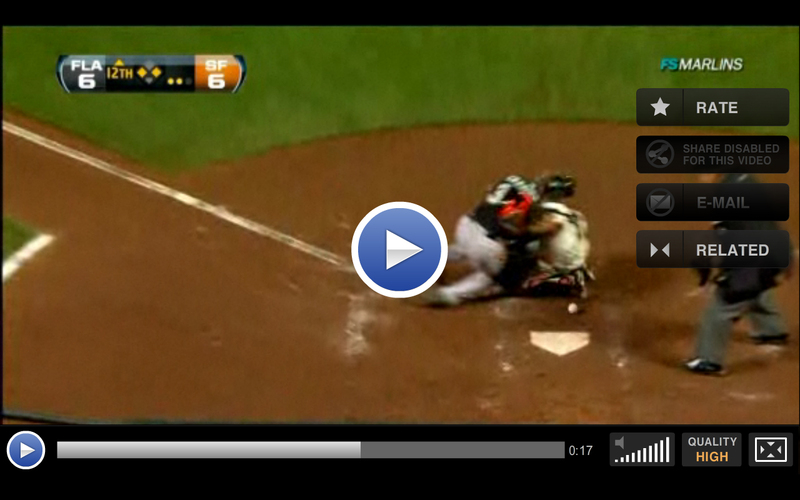 Buster was in front of the plate when he caught the play. The correct play for a runner in that situation is to slide to the backside of the plate, but Cousins veered left and speared him. You could see Posey laying in the dirt and struggling to move. Maybe I need to watch the reply again for the 20th time, because the media keeps saying it was a clean play. I don't see that when I watch the reply. And she's right. It wasn't really a clean play. Here's another screen grab from the moment of impact. Expect the Bay Area to go full tilt Zapruder on this play. McCovey Chronicles rightfully calls for less contact at home plate, brining to mind another infamous crash at the 1970 All Star game. Maybe another rule change will come a little too late for the Giants. And, man, how I hope it does. Barreling into a catcher adds nothing to the game of baseball. It never has. Every time I'd watch Pete Rose barrel into Ray Fosse, I'd think how messed up it was. It never really hit home until now, but it's the only element of contact in a non-contact sport. It's like the NFL using Scrabble to decide games that are tied after regulation -- it's the exact opposite of how the rest of the game is played. MLB.com says that this will probably be it for Posey this season. "The National League's reigning Rookie of the Year will likely be sidelined for the entire season." His full condition won't be known until he undergoes a MRI. Update: Many, if not most, of our commenters think the play wasn't dirty, just part of the game. Let us know your thoughts in the comments. Afternoon Palate Cleanser: Happy Birthday, Stevie Nicks!